It's refreshing. To just be like "So... photos?" and the other person knows exactly what you're thinking. Usually when I ask a friend or someone to take my picture, there is this confused look across the face, and some mumbling about not knowing camera settings. Then I feel uncomfortable, the pictures turn out *just okay*, and it's usually a bit of an embarrassing encounter. This... smooth sailin'! What a relief. Love the colors, these photos are great! love this outfit! those moccasins are the best! these photos turned out great! perfect simple outfit for the 4th. love those mocs. I'm in love with that first photo! It's the combination of your pose, the bangs, the outfit... it's perfection. stunning! i love it when i'm with people who understand how to take photos. that skirt is so cute and i love the red moccs. and omg I'm so happy that Dov Charney was fired too. I enjoy the patriotic colors in this outfit and how simple and cute it is. 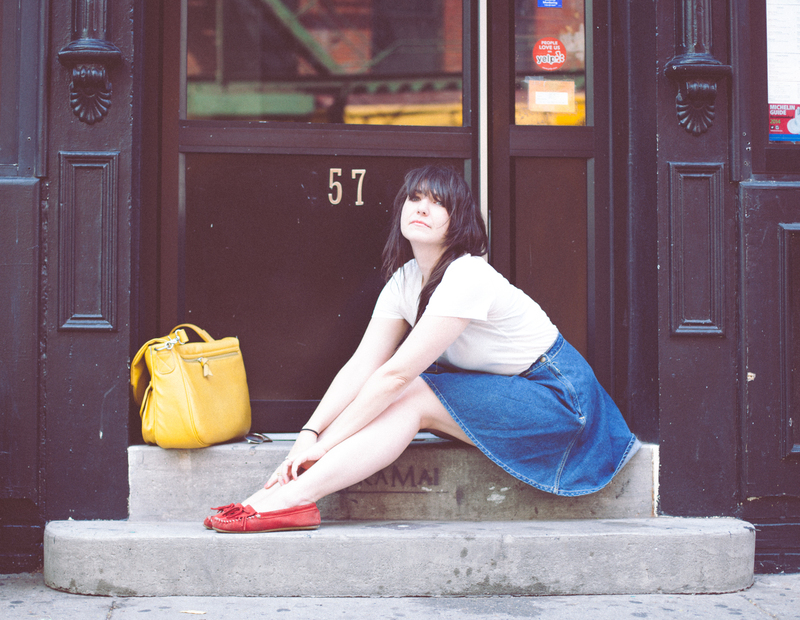 The denim circle skirt is perfect with those red shoes. Also it must be awesome to have someone to take perfect outfit pictures with! My sister and boyfriend do a pretty good job in a pinch though! The bright yellow and the red with the denim is just perfect <3 You look darling! It is really great when the other person does just seem to get it when you say "photos?" Also, digging those red mocs!